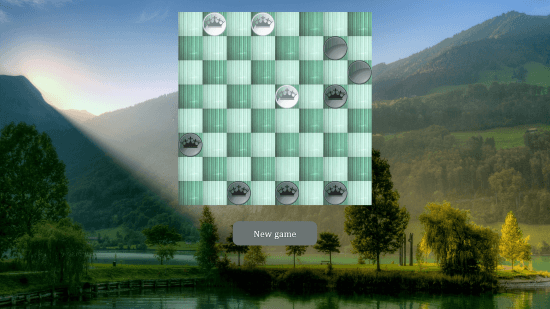 Checkers Absolute is a simplistic free strategy game for Windows 8 and 8.1 computer. This awesome game is actually inspired from a strategic board game, which has the same name, “Checkers“. 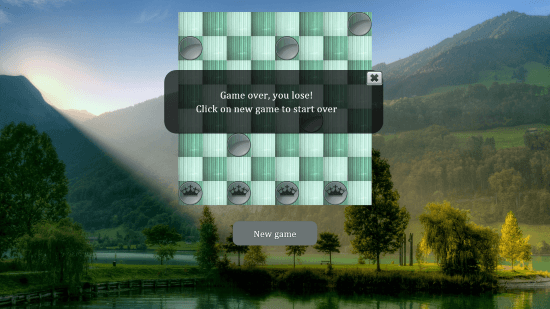 Checkers Absolute is a single player game, which you have to play with the computer as opponent. Both the players are assigned pieces of different color: White, and Black. You have to make moves to cross out each others’ pieces, and win the game. This free Windows 8 strategy game is very light, and occupies only 1.9MB of space on your computer’s disc. The background of the game is visually appealing. When the game starts, you will see only one option: New Game. There is no option for settings, or gameplay. The game’s design is very minimal, and it runs without any lag. The game board of Checkers Absolute has 8 rows, and 8 columns. There are 12 White, and 12 Black pieces to play this game. You will be assigned the White pieces, while the computer will play with the Black pieces. As you can see, the board is checkered. A piece can only be moved in diagonal direction, and only across a single box. You can not move the piece backwards. The only way you can move a piece backward, is when you reach the opponent’s starting side. You have to continue playing unless the opponent is out of moves, or out of pieces. To take out opponent’s piece, you have to diagonally jump over it to the second diagonal block. You can only take out a piece if the second diagonal box is empty. If it is filled with your piece, or opponent’s piece, you can not take that piece out. You can freely move any piece in either of the forward diagonal direction. When you keep playing, and one of your piece reaches the opponent’s side, it is marked with a crown. The marked piece can be now moved in backward direction. When all of yours’, or your opponent’s pieces exhaust, the game gets over, and you can restart the game. Press the New Game option to replay. This is a really difficult to play Windows 8 strategy game, and you have to utilize you brain’s might to defeat the opponent. You need to practice a lot to win this strategy game. There is no level setting provided as well, to increase or decrease the difficulty. Download Checkers Absolute for your Windows 8 and 8.1 PC.